Disclosure: Thanks to Vaseline for sponsoring today’s content. I received a free review product to facilitate this post. The opinions are my own. The weather keeps playing tricks on me, but I think it’s safe to say, I can finish packing up my winter clothes and get ready to break out the shorts, capris, tank tops, and sandals. With this change of wardrobe comes a little extra body care and maintenance. You know the drill: shave legs, trim and paint toenails, exfoliate as needed, and last but not least, use a good moisturizer on your skin. 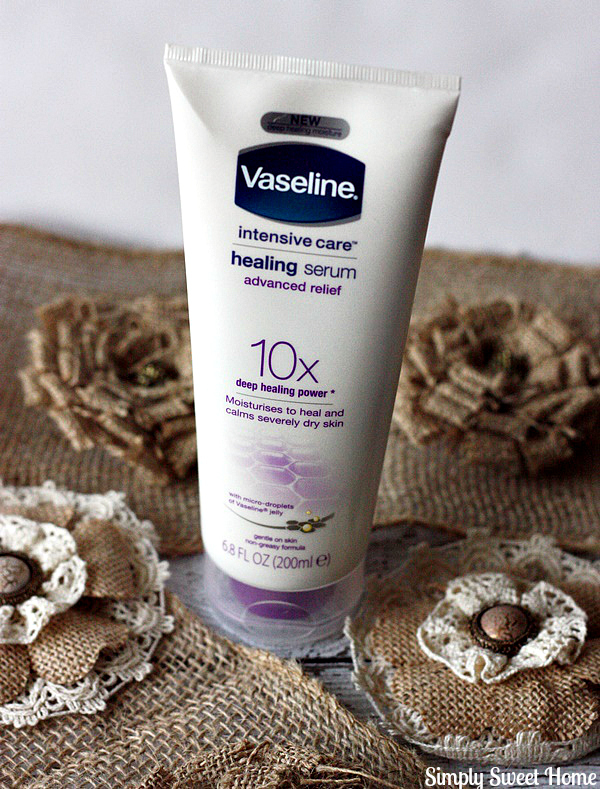 This spring I’m using Vaseline Intensive Care Advanced Relief Healing Serum. I remember my mom using Vaseline products every day when I was a kid. She always had their lotion and petroleum jelly on hand, and if it’s good enough for her, it’s good enough for me! The Vaseline Intensive Care Advanced Relief Healing Serum is not your average moisturizing lotion; it is a serum that not only moisturizes the skin but also helps to heal the skin, boosting the skin’s natural renewal cycle and helping to form a protective layer to prevent moisture loss. And of course, it leaves your skin looking and feeling silky smooth. I’m also in love with the scent of the product. They have three different varieties, and the one I tried features scents of rose and amber. It is a very pleasant and lovely scent, like a soft perfume, and yet it’s not too strong or overwhelming. It’s also a lightweight formula and not at all greasy, which is a real plus! This is a great product for the entire body, and I’m looking forward to using it all summer long! You can find Vaseline Intensive Care Healing Serum on Amazon and at your local retailers.